On a recent visit to Norwich Vermont I stopped in at the Norwich Bookstore, a lovely little book store — warm, welcoming with a small but smartly chosen selection. If you ever get a chance, stop by. It reminded me how much I love book stores: browsing through what seems like an infinite amount of fascinating possibilities. Even after I was familiar with most of the current work in my particular areas of interest (modern poetry, mainly) book stores could surprise me with something new, something unknown, something unexpected. Which got me to thinking about my favorite book stores. Which in turn got me to thinking about how many of my favorites are no longer around. It's sad, but not surprising after 30-40 years. And also not too sad since the fact is I have very fond memories of each store that keeps them in my thoughts. As I look over my bookshelves, certain books are intimately connected to the store in which I found them. So here's an ode, an elegy if you will, to some of my favorite book stores that are no longer with us. I had no idea of the heritage of Phoenix Book Shop when I found it, near where a friend lived in Greenwich Village. I just knew it was a tiny store chock full of amazing poetry books in the lower level of a residential street. 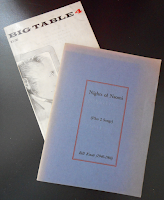 I found old copies of Big Table magazine there. And I found a copy of the original The Nights of Naomi by Bill Knott. It was like discovering King Tut's tomb. What's more it was affordable! The price written in pencil on the inside front cover is $3.50. 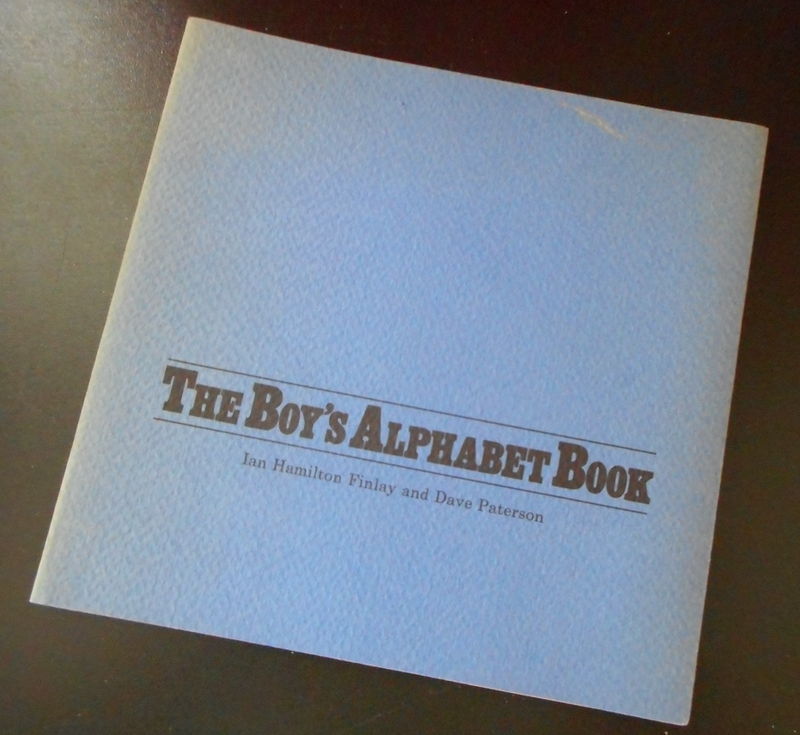 Even then, unnaturally cheap for a book whose publisher went out of business before it could be distributed. I took it to the front where the person sitting at the desk looked at the price, looked at me, then looked at the price again and said "This can't be right." I felt like a thief caught in the act. But after what seemed like 2-3 minutes silence he shrugged and sold it to me for the price as marked. The store was full of beautiful volumes, most well beyond my means. But even a few old magazines and the rare find like the Knott book made me feel like I came away with buried treasure. What can I say? It was Gotham Book Mart. The holy grail of book lovers, and particularly poetry lovers, in New York City. So much to discover. Barely room to stand up. The books (at least in the poetry section) were double stacked on the shelves, making browsing a physical challenge. But always worth it. And then there were the tables with stacks of books (recommended? I guess) when you got tired of struggling with the shelves. Anything but a relaxed ambience, but you had the feeling you were knee-deep in literature itself. When I was in London in 1977, someone told me about Compendium Books. So I took the train over to see it and ended up making several stops there before I had to leave England. Wow! It was like Gotham Book Mart, except in London and without the NYC bustle. More relaxed. The shelves were crammed, but the aisles were wide enough you could take your time. Camden wasn't hip then — just a cheap place to rent space. And the ambience was more hippy flea market than NYC subway. Among the British poets, they had a surprising array of American poets too, including a number of Kayak books. 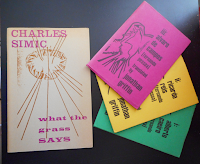 I found Charles Simic's What the Grass Says there. And it was my first discovery of Portugal's Fernando Pessoa in Jonathan Griffin's exquisite translations published by Carcanet. I always felt like I came away with only a fraction of what I needed to know or experience. But even at their prices, I only had so much money — and time — to spend. I didn't know Asphodel when it was located in downtown Cleveland. I discovered it after James Lowell moved it into the garage of his house in Burton Ohio. Not a regular bookstore — you had to call to arrange a visit. But Lowell's"shop" was packed with the most amazing collection of books. Given his history, and my lack of funds, I'm surprised he put up with me. But I was in love with modern poetry and he liked to talk. So he let me look through his shelves oohing and aahing over marvelous books (most of which I clearly couldn't afford). He talked about visiting Ian Hamilton Findlay — one of my recent personal "discoveries" — and complained about how Findlay never took enough care packing anything so half of what he ordered arrived damaged. Which is why he would go in person to Scotland once a year to restock. Asphodel is where I first saw an original copy of Andre Breton's Le Surréalisme au service de la révolution; several issues. I don't remember what I bought there. Probably not much. But I did buy a Findlay silk screen of tug boats entitled "Triptych". (Sadly, lost during one of many moves over the years.) And James gave me a signed pamphlet by Robert Bly for free. Because, he claimed, "Bob gave it to me to make a few extra bucks off people who can afford it." Before there was the internet, before there was Amazon, there was mail order. And if you were interested in modern poetry, Spring Church was an absolute necessity and life support system. I don't know who told me about Spring Church — maybe Tom Lux or David Young, maybe Phyllis Jones my freshman college English professor. But whoever did, thank you. Spring Church was a mail order book service originating from Pennsylvania focusing on poetry. Living in Ohio in the 70's it was difficult to know what was happening in modern poetry. Spring Church provided three invaluable services: 1.) a catalog of recent books sent out four times a year or thereabouts, including many small press offerings; 2.) recommendations of books of particular note; 3.) a discount on the books themselves! I lived off Spring Church much of the time I was in college and the two years after while I was still in Ohio. I suspect I bought more books from them than from all of the traditional book stores combined. They were a lifeline, a source and trusted companion in this new world I was exploring. I have since found other wonderful book stores and many happy surprises in quite ordinary shops. But these four in particular are experiences I will never forget and I will always cherish as significant milestones in my growth as a poet, a reader, and a person. I will always be indebted to the people who made such wonderful oases of art and literature available. Thank you.